Comes with 32-page booklet, housed in book style CD size hard case. LP in gatefold sleeve, 12" EP, hand stamped 7", postcard set and 24-page book, housed in a clothbound box. 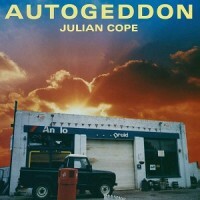 Autogeddon concludes a trilogy of started by Peggy Suicide and Jehovahkill, it showcases Cope’s continuing focus on heathen religious practices and ancient monuments.